Why "Much-Requested"? There's just something about these meatballs! The recipe for my meatballs is a perennial favorite among my personal chef clients, students in my healthy cooking classes, kids of all ages, picky eaters, carnivores... just about everyone! I've probably made these for more people than any other recipe in my repertoire. Bonus: They happen to be ridiculously easy to make and super-healthy. They get their amazing flavor from one of my favorite spice-aisle finds "no-salt Italian seasoning." I use it in so many recipes I write — it miraculously makes just about any dish taste like it came from my Italian Grandma's kitchen. Try it in tomato-based sauces, soups, stews, ratatouille and even vinaigrettes. These meatballs also happen to be an ideal make-ahead meal because they freeze exceptionally well. Keep a batch or two on hand for tired 3rd trimester "what's for dinner" nights or when you're prepping for baby's arrival. Or steal an idea from my friend: She keeps them stashed in her freezer at work in pre-portioned sandwich baggies for a quick low-carb and high-protein lunch or snack. Smart idea! My personal favorite way to serve them? 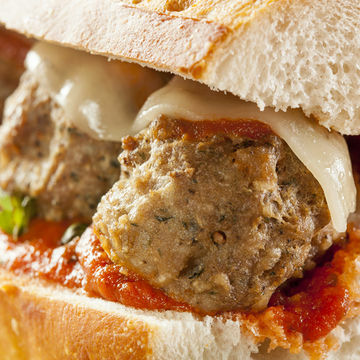 In fun little meatball sliders topped with sauce and low fat shredded mozzarella. Be warned — once you start making these you'll be getting constant requests for them, too!